Loel Diggs, formerly of rural Rolfe, Iowa, (D.M.T. 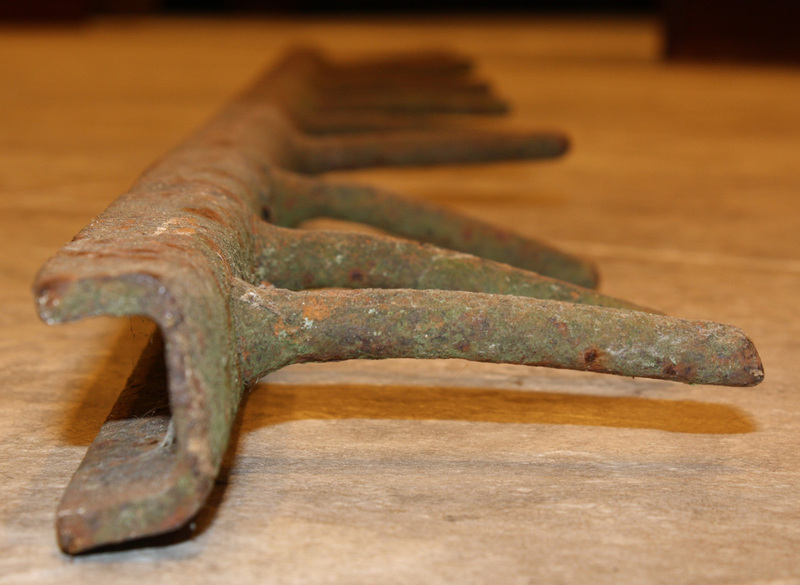 ’56) saw my post that included a photo of a manure spreader beater bar. Doing so prompted him to send to me two photos and manure spreader-related memories from his youth. I found these pictures* that my Mom took of me when the mid summer (after oat harvest) manure hauling season was going on. I had two uncles** that were involved in raising livestock, as my parents*** were, so a couple weeks in early August were spent removing all the manure piles around the barns and the cattle sheds cleaned out. I wasn’t old enough to run the tractor with the manure loader, but was old enough to to run a rig back and forth from cattle yard to field. Really felt grown up, (even though I was only about 11 years old when these pictures were taken) that I was trusted with a rig, to drive it, unload it and not tear the spreader up. At the time these pictures were taken the spreaders being used were all recently converted horse drawn spreaders being pulled by tractors. Being that the spreaders were designed to be pulled by horses, the mechanics of the spreaders could be stressed very heavily during manure hauling season, because of the increased speed capable with a tractor over the speed of horses. Even at the age I was, I was reminded that if I broke the unload mechanism (floor conveyor chain) I got to unload the spreader with a pitch fork. I recall in having that honor only once or twice, with help in pitching it off from my Dad, of course! 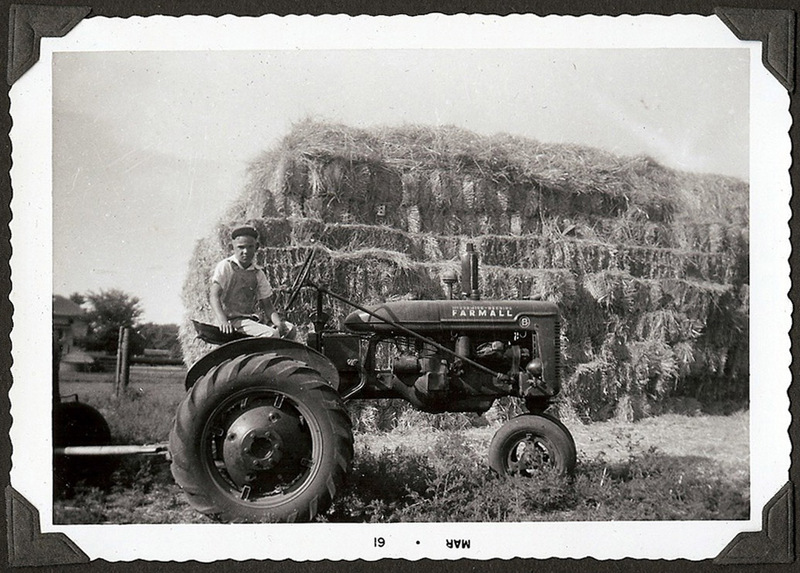 Relating to the beater reels and bars [referred to in a previous post], if the baler twine was not always taken out of the hay being fed or out of the straw being used for bedding you would spend time cutting the twine off the beater reels and bars with your jackknife. You might say you could get up close and personal with beater bars—— doing that type of cleanup! *The second photo will be posted in Part II. **Loel’s two uncles referred to here were Conrad and Franklin Majorowicz. This entry was posted on January 25, 2011 at 9:04 am and is filed under Uncategorized. You can follow any responses to this entry through the RSS 2.0 feed. You can skip to the end and leave a response. Pinging is currently not allowed. Good picture of Loel. His ears still stick out like they did when he was 11. Good to see he is reading the blog. Loel had mentioned twine on the manure spreader bars, that was a mess, but what was worse was bailing wire. It seems before baling twine they use baling wire, and you could imagine getting that off the spreader bars. Baling wire helped the USA win WW II. Lots of equipment was kept running with the use of Baling Wire. All of our tractors had a hammer, pliers, cresent wrench, screw driver and Baling Wire. You could repair most breakdowns with that assortment. What fun!